Sales increased 13% in volume in the first half of the year, and 15% in dollars, according the information released today by the BA. 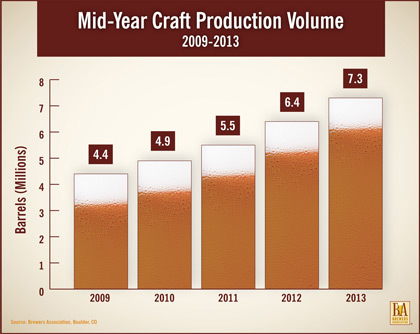 During the first half of 2013, craft breweries sold approximately 7.3 million barrels of beer, up from 6.4 million barrels over the first half of 2012. Overall, beer sales were down 2% through the first six months of the year. The BA also reported there are 2,538 breweries operating in the U.S. as of June 30, 2013, an increase of 446 breweries since June 2012. The BA lists an additional 1,605 breweries in planning at the year’s midpoint, compared to 1,252 a year ago.